Spectropol is proud to release a sublime collaboration from improvising musicians Tetuzi Akiyama (Japan) and Johan Arrias (Sweden). 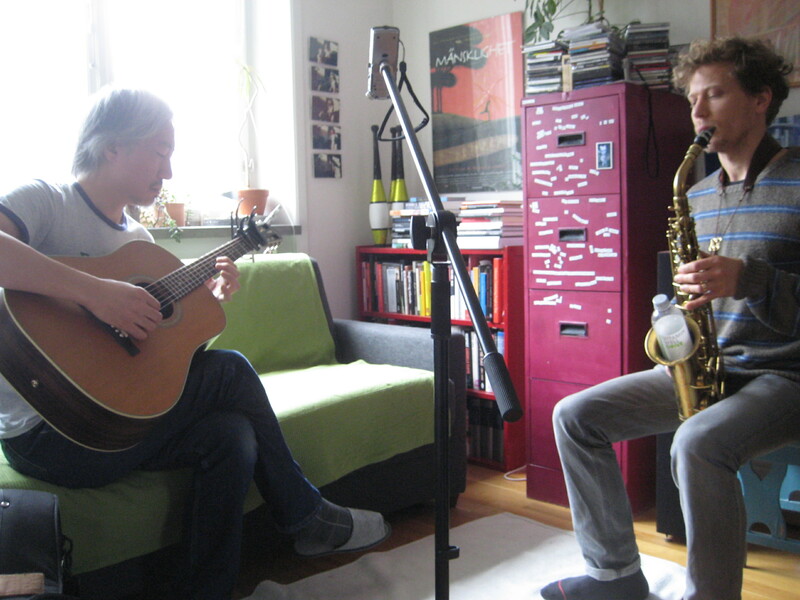 This is the unedited outcome of the impromptu meeting of Tetuzi Akiyama on acoustic guitar and Johan Arrias on alto saxophone, on a Sunday morning in a minuscule Stockholm living room. Having toured and recorded together years before in a quartet format with the formidable Gul 3, the musicians knew each other well, but this was their first duo session.No preset parameters here. After a glass of black coffee and slightly diverging words on the structure ­- one long piece or shorter ones? ­- Johan shoves a plastic bottle down the bell of his alto, Tetuzi strokes a string, and they’re off. No distinct melodies or rhythms, yet the music flows with a gentle insistency and retains a strong sense of direction and purpose throughout, its beauty heightened by moments of dissonance. At times reminiscent of a koto-­shakuhachi dialogue, the core feeling is one of deep trust and respect. Every note, every sound counts. In the room, in the moment. Slow breathing, just as Tetuzi had suggested. Tetuzi Akiyama plays the guitar with primitive and practical implications, by adding a desire of own to the instrument’s characteristic nature in minimal and straight method. He delicately and sometime boldly controls the volume of the sound from micro to macro level, and tries to quantize his physical system. Besides making variety of solo albums which covers from fingerpicking and slide acoustic guitar atonalism to noisy experimental drone to never ending boogie, he have made many albums in collaboration with highly praised artists such as Jozef Van Wissem, Donald McPherson, Greg Malcolm, Bruce Russell, Günter Müller, Jason Kahn, Michel Henritzi, Phantom Limb, Gul3, Tim Barnes, Oren Ambarchi, Martin Ng, Anla Courtis and Alan Licht, just to name a few. He is also a band member of Koboku Senjû, Satanic Abandoned Rock & Roll Society and Hontatedori. Akiyama is a frequent guest at international music festivals in East & West Europe, North & South America, Australia and New Zealand in recent years. Johan Arrias is a saxophone and clarinet player active in the field of improvised, experimental and contemporary music. He works with deconstructing and fragmenting the traditional play on his instrument with extended techniques and preparation, regarding sound as an autonomous matter. This has led him to also start working with sound art. When composing music he moves freely from traditional to graphic notation and concepts. Since 2005 he is based in Stockholm where he is active with groups as Jaas, Arrias/Ullén, Arrias/Liljedahl among others. He collaborates/have collaborated with musicians such as Tisha Mukarji, Angharad Davies, Tetuzi Akiyama, Axel Dörner, Derek Shirley, Kai Fagaschinski, Lucio Capece, Joe Williamsson, Audrey Chen, Katt Hernandez, Anna Lindal, David Stackenäs, Christer Bothén, Nina de Heney, Daniel M Karlsson, Andreas Backer, Jonatan Liljedahl, Lisa Ullén, Vilhelm Bromander, Henrik Olsson, Emil Strandberg and more. He has toured in Sweden, Norway, South Africa, USA, Poland, UK, Germany and Rumania and released records on labels such as MonotypeRec, Headspin Recordings, Crazy Wizdom, Jahr null Aufnahmen. “Bromma” was recorded on Nov 10, 2013, on a Olympus LS­11 portable recorder. Duration: 27 minutesRecording and text by Jan Nygård.